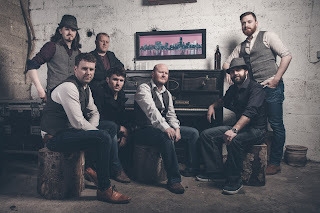 Mayo’s Vickers Vimy [above] is a folk and Americana band that have worked with the late John Martyn, as well as the Hothouse Flowers, Maria Doyle Kennedy, and Mundy. They released their first album, Vol. 1: That vinyl scratch in 2013 and since the release of their second album, Atlas of hearts, in March 2018 this four-piece have regularly graced radio airwaves across the country. Comprising Ed Drea (vocals and acoustic guitar), Fintan Hanley (electric and acoustic guitars, mandolin, harmonies), Eamonn Mulderring (drums, percussion, piano, accordion, midi, harmonies), and Ciarán Byrne (bass, guitars), Vickers Vimy will play a series of free gigs throughout the Dunmore East Bluegrass Festival filled with rich eclectic sounds that anchor lyrical themes of scratched vinyl nights and hazy Sunday mornings. 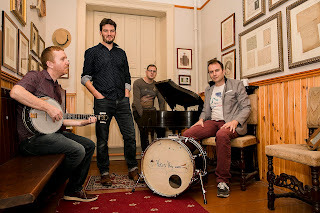 Another Irish act to make their Dunmore East Bluegrass debut is Navan-based Pilgrim St [above]. The seven-piece outfit bring a broad range of Americana, country, folk, and bluegrass to their concerts across the country. Having been together for over four years, Pilgrim St have played some of the finest arenas in Ireland including Vicar Street and Electric Picnic, and Dunmore East Bluegrass Festival-goers can expect a lively and energetic performance from Navan’s finest. The 24th Dunmore East Bluegrass Festival, Co. Waterford, kicks off on Thursday evening, 23 August, at the Spinnaker Bar and Restaurant, and heralds the start of fourteen bands, playing almost forty free gigs throughout the village. For more information visit www.discoverdunmore.com or keep up to date on the Discover Dunmore East Facebook page. Mick Daly is available for interview on 051 878 832 / 087 256 2899 or e-mail.